COLOGNE, N.J. -- Back during the big golf course boom of the 1990s, when every year seemed to bring a new upscale daily fee course to the Jersey Shore, Blue Heron Pines seemed at times to get forgotten amid all the glitz and glitter. Blue Heron Pines, if you don’t recall, was the first of the first-rate publics at the Shore, dating back to in 1993. But as more and more premier courses joined the Shore lineup -- Sand Barrens, Pine Barrens, Sea Oaks, Cape May National, Twisted Dune, Shore Gate and, let’s not forget Blue Heron Pine’s late, great younger sister course, Blue Heron Pines East -- the original Blue Heron Pines felt a little, well, tame by comparison. At least, that’s how I felt 10 years ago, when I was convinced that the more difficult a golf course was, the better it was. Back then, I played from the tips, always, and yawned if I found a golf course’s rating and slope too lacking for my tastes. I wanted to do mortal combat with the course every time I teed it up. These days, not so much. I’m older, if not wiser, and I don’t hit the ball as far any more. I walk right past the tips now, headed for whatever set of tees measures between 6,350 and 6,600 yards, thank you very much. I’ve also lost much of my taste for golf courses that make me feel like I’m riding a bucking bronco. Who needs their manhood called into question by crazy-long carries over water or greenside bunkers with 10-foot vertical walls. All of which probably goes a long way toward explaining my newfound appreciation for Blue Heron Pines, which I recently played for the first time in more than five years. At Blue Heron Pines, there is plenty of sand – bunkers and waste areas abound – but when your ball finds aforementioned sand, it’s not automatically a double-bogey death sentence. You take your medicine, punch out, and move on, usually without spoiling your round or your day. This is not to say that Blue Heron Pines is some kind of neutered, push-over of a course, because it is not. From the championship tees, which play 6,810 yards, the rating is 72.8 and the slope is 135; those numbers aren’t chopped liver. And yet, you can go all day at Blue Heron Pines, where the topography is flat and the fairways are lined by pines, and never once gulp or sweat because you’re facing a shot you don’t have. Course Tour. Scorecard. This, of course, is a testament to the user-friendly design of Stephen Kay (Scotland Run, Architects Club, Harbor Pines, McCullough’s Emerald Links), who wanted to build a course that could be enjoyed by both the low handicapper and the retired couple that owns a condo at Blue Heron Pines. Although Blue Heron Pines has plenty of members and regulars, it plays like a resort course. By that, I mean there are no blind shots, no trick holes, no need to return three more times before you understand all the nuances of the course. You can see it all standing on the tee. Kay eases you into the round with a simple, short, straightaway par 4 that requires no more than a passable tee shot and a short iron, into a wide, forgiving green. If you struggle here, it’s probably going to be a long day. The pace quickens beginning with No. 2, a mid-length par 3, where the front of the green is guarded by wide, deep, ball-gobbling bunker. That’s followed by a three-shot, dogleg par 5 and another mid-length par 3, with water up the entire right side. The best holes on the front nine might well be the 323-yard 7th , one of five short par 4s at Blue Heron Pines. The tee shot must carry a sizable sand pit up the left side, and the approach shot is over another chasm of bunker. The back nine begins with a testy dogleg par 4, just under 400 yards long. With bunkers on the right in the fairway landing area, and a lake and a series of three bunkers to contend with on the approach shot, there is no room for error. The 11th, a short par 3, has drawn comparisons to the 10th at Pine Valley, because of a slippery, sloping green and a menacing pot bunker in the right front of the green, a nod to the notorious Devil’s Arse at the Clementon course. Sorry, but there is no comparison between the two. Still, the back nine is a better and more fun to play. The best stretch of holes is 13 through 15, where you must negotiate a short, sharp dogleg that demands complete accuracy; a dogleg par 5 with a vast waste bunker in the middle of the fairway, and a dicey dogleg par 4 with a waste area to carry of the tee and a lake up the left side. The 14th , in particular, is a memorable hole. At 518 yards, it’s a lazy dogleg par 5, reachable in two by long-hitters but a three-shotter for the vast majority of golfers. From the back tees, just to reach the fairway, you must carry a lake and a series of three bunkers up the left side. The more daunting shot, however, is the second, over an expansive sandy waste area that is often likened to the aptly-named Hell’s Half Acre, in the middle of Pine Valley’s 7th fairway. If you go for the 14th in two, you must not only blow it over the waste area but also a bunker that guards most of the front of the green. The best way to end any round of golf is with a birdie, and Kay gives you that chance with a closing hole that is an creampuff of a par 5. At 529 yards from the back tees, it’s short enough for even plenty of mid-handicappers to reach in two. A slight dogleg right, the fairway is wide open in the landing area; a fairway bunker well short of the green poses no real problem and a wide-open green welcomes the run-up shot. Blue Heron Pines gets respect from both Golf Digest, Golfweek and GolfWorld. Digest’s Places to Play guide, in which ordinary golfers, not raters or editors, evaluate courses, gives Blue Heron Pines 4 out of 5 stars. 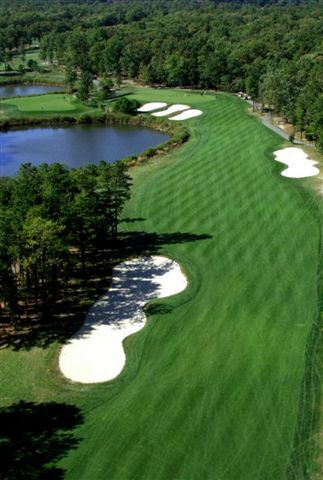 In Golfweek’s 2010 state-by-state rankings of Best Courses You Can Play, Blue Heron Pines ranks No. 15 in New Jersey. In GolfWorld’s Readers Choice Awards, Blue Heron Pines ranked 34th among public courses nationally. I’m inclined to agree. While Blue Heron Pines isn’t the wildest ride of a golf course at the Jersey Shore – see Twisted Dune and Shore Gate – it is a rock solid round of golf that has stood the test of time for good reason. The green fees are in line with the rest of the Shore courses. There are so many variations and promotions – in-season, off-season, daily, weekend, primetime, twilight – that Blue Heron Pines doesn’t list its rates schedule on its website; instead, it instructs you to call the pro shop (609-965-1800) for the best deals. That said, the basic rates, in-season, from June 2 – Sept. 7, are $103 Friday through Sunday mornings, dropping to $89 from noon-3 p.m. and $55 after 3 p.m.; corresponding weekday rates are $88, $78 and $55. After a couple of bumps in the ownership road, Blue Heron Pines is now in the hands of New Jersey businessman Rockford Chun, an avid and accomplished golfer, who seems to have a steady hand on the tiller and big dreams for the future. The west course was amazing , the conditions were like playing one of the privates. i have had an opportunity to play all the shore courses this summer , i only wish we would have played Blue Heron earlier ... some of the courses at the shore have been in bad shape due to the heat . Blue heron was perfect A+ .... play it now it is also my favorite course to play in the fall, great grill room with out side fire place . Blue Heron East was a great course. BHP is the site of my first hole in one-on a Friday the 13th no less- at the 4th hole.. What’s really a minor tragedy is that the Smyers course- BHP East- was a really good course but was sold and now no longer exists.